"Most cells within the adult brain require sugars to produce energy and sustain function. Interestingly, we have discovered that malignant glioma cells have a completely different metabolic strategy as they actually prefer to break down fats to make energy. "Our finding provides a new understanding of brain tumour biology, and a new potential drug target for fighting this type of cancer." The study made use of tumour tissue donated by patients undergoing surgery, as well as mouse models of the disease. Findings of the research are published online in the journal Neuro-Oncology. In the study, the scientists claimed to show that glioma cells grow more slowly if they are treated with a drug known as etomoxir, which prevents the cells from making energy with fatty acids. But they said that it does not address whether nutrition or diet influence tumour growth. Dr Stoll said she hoped to carry out future studies to develop the drug with clinical partners, so that glioma patients may benefit from the research in the coming years. And a lot of these unspeakable crimes are being committed by women. The level of horrific barbarities being committed in Lango is almost beyond human comprehension, and this is a daily occurrence. Hudson Apunyo, a Lira based journalist, chronicles this grotesque barbarity and sends me the pictures. It breaks my heart. What more can I say? . I have lost a country, but now I am beginning to think I have also lost my people. 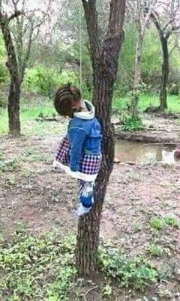 She was hanged by Mummy because she never wanted her new boyfriend to know that she has another kid from somewhere else. 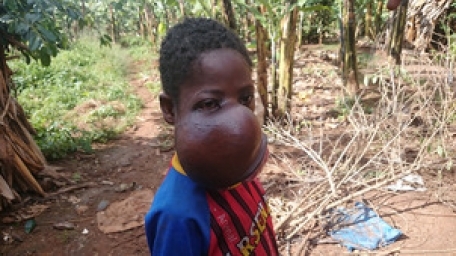 Erick the Ugandan boy who has been given a new face after surgery in the United Kingdom. 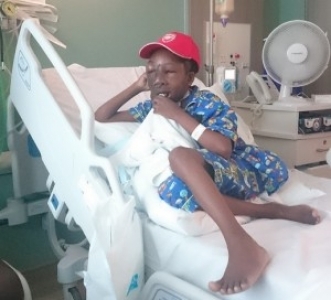 Since this documentary was filmed on 5 Star Channel TV in Britain, Erick’s tumour had started to recur and he needed further medical treatment. However, afterwards this operation was a success and the young boy was returned to his country, Uganda. A very happy boy indeed. Babirye in bandages after operation. She is four years old and suffers from congenital multiple joint deformities. Her treatment had started 17th March 2015 at Physi-Tech Rehabilitation Centre. The family and friends contributed to this cost of about 350000/- Uganda Shillings(£70.00) and run out of money. There are two major Radio Stations in the country which had taken interest in fund-raising on her behalf. Bukedde Radio refused to take up the offer but Radio Simba did for sometime. After what seemed to start as a successful fund raising campaign, the Director of the programme suddenly stopped the project and advised the single mother of the patient to switch off her phone number. There was no clear explanation given other than to be told that there was no one interested in her requests for charity. 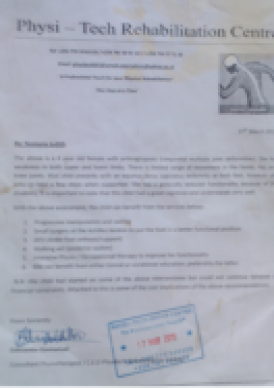 Since then up to now 14 January 2016 no financial assistance has ever come to Nassuna Judith Babirye. She is looked after by her very poor single parent mother M/s Rose Nibogeza, a Christian Catholic lady from Bugwere/Pallisa Province of Uganda. Presently she lives at Mpererwe, Namere, in Kawempe Zone. She has the responsibility of looking after the young twin sister of Babirye known as Nakato and another 2 sets of twins who are fortunately very normal. One set of twins is 7 years old and another set of twins is 9 years old. They belong to a parental father Mr Salongo Ndorabo Manuel, who unfortunately has left M/s Rose and migrated back to his homeland of Ruanda. 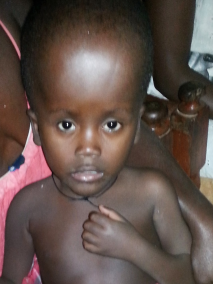 Nakato is starting school soon this year if her mother can manage to obtain the School fees. Babirye will certainly be a very lonely girl staying put at home in a wooden panelled- walled house structure alongside a dusty road with no one to play about with in the small dusty front compound. Life indeed is going to be very tough for this very young human being. If there is any one on this planet interested in the dilemma of this family, the mother can be contacted personally on this telephone number: Uganda: 0773534765. One understands of recent that some help from very concerned parents is forthcoming for these twins to live a more hopeful life. Amecet receives, on average, two abandoned children in Teso sub-region every week. Soroti - An Unknown woman has dumped her four-month old baby boy under a tree in Arapai sub-county, Soroti district under unclear circumstances. The baby wrapped in clothes was found by a passerby lying under a tree and decided to carry it to the police in Arapai police post. The Police founf a chit indicating that the baby belongs to one Felix Odongo of Abarilela, Amuria district who is believed to be a teacher. there were also telephone contacts of the said father though they were not going through. "I have decided to contact the director of Amecet, an orphanage in Soroti to take care of the baby as police mounts a search for the baby's mother," Atim said. Els Van, the director of Amecet, told New Vision that this is the second baby to be recovered in a period of one week. "Last week police recovered a one-week old baby dumped in Katakwi district and was brought to our care. Her mother has not been found and we hope that the parents shall show up one day," Van said. She explained that they receive on average of two abandoned children in Teso sub-region every week. Kyoga East regional police Commander Juma Hassan Nyene said the problem is big and it's majorly school girls that dump children. Nyene explained that young girls are made pregnant by irresponsible men who do not offer any assistance to a woman. "Some girls after realizing that they made a wrong choice to date irresponsible men, they resort into abortion while others who may fail to abort end up dumping children on the road side," Nyene said. Nearly half (49%) of women aged 20–49 years were married before the age of 18 years and 15% by the age of 15 years according to Uganda Bureau of Standards. in the world, Barclays Bank. She can be contacted by mobile phone that she holds in her belongings. The phone number by 13/08/2016 is: 0755085330. She says that she has looked for help from the Medical Fraternity in the Ministry of Health without any success. Unfortunately for this young girl, she is very difficult to trace nowadays(28/06/2016). What one finds in some of these very miserable situations is that there are other humans in the control and care of these worse off humans on whom they are very dependant on for their dear life! Some do not want to be photographed at all or take their details. One reckons she lives in real fear of her leg being cut off completely by her medical advisers. Former Forum for Democratic Change (FDC) presidential candidate Dr Kizza Besigye has joined well-wishers in a fundraising drive involving a car wash to raise more funds to treat Ms Carol Atuhirwe, who needs Shs270m to undergo intensive medical examination in the US. Besigye on Saturday took his car to be washed at Panamera Bar in Naguru opposite Kampala Parents School where the fundraising drive was held. 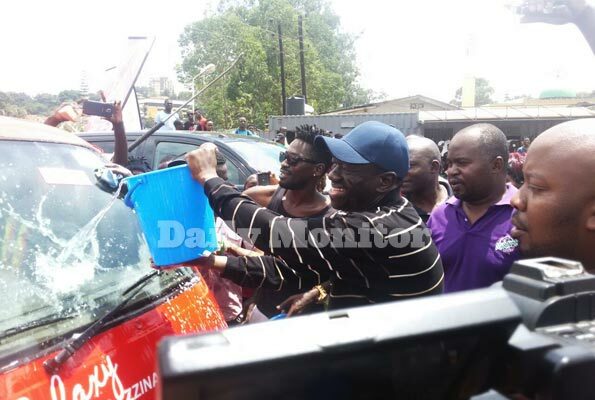 He joined several other well-wishers and companies who thronged the place to have their cars washed at Shs50,000 each. Motorcycles are being washed at Shs20,000. Earlier, Uganda National Roads Authority (UNRA) paid Shs100,000 for the Caterpillar and Shs1,750,000 for 35 other cars (at Shs50,000 each). Ms Atuhirwe, who is currently admitted to Mulago hospital, was first diagnosed with cancer of the throat (larynx) in 2011 but later developed lung cancer, which she has been battling for the last five years. A social media campaign running under the ‘SaveCarol Campaign’ has so far raised Shs117m, leaving a balance of Shs153m to make Shs250m. Mr Muhereza Kyamutetera, the coordinator of the ‘SaveCarol Campaign’ and chairperson of committee, said Ms Atuhirwe’s family needed supported now having been drained by the five-year battle to save their daughter. 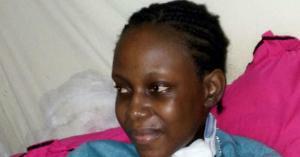 Ms Carol Atuhirwe needs Shs270m to undergo intensive medical examination in the US. Ms Atuhirwe, according to Mr Kyamutetera, has so far undergone more than 30 surgeries and the several chemotherapy sessions have caused severe burns and a broken esophagus. According to Mr Kyamutetera, Ms Atuhirwe is currently unable to talk and feeds through a tube but is able to communicate through writing. The drive comes just days after The Aga Khan University Hospital in Nairobi (AKUH-Nairobi) announced that it will work with the Ugandan government to provide as many as 400 cancer patients with free treatment in response to the breakdown of Uganda’s only radiotherapy machine. “We are committed to working with the Government of Uganda to help save the lives of cancer patients in need of treatment while it works to re-establish its radiation therapy capacity,” said AKUH-Nairobi Chief Executive Officer Shawn Bolouki. The announcement followed a statement by Uganda government in which the health minister said only 400 out of the 17,000 cancer patients, who need radiotherapy care will be airlifted to Kenya for treatment. Meanwhile, the executive director Uganda Cancer Institute (UCI), Dr Jackson Orem yesterday emphasized that patients with advanced cancer and in dire need of radiotherapy treatment will not be sent to Nairobi for medication. Dr Orem said preference will be given to patients whose cancer is just starting because they have higher chances of surviving than those whose infection has widely spread in the body. “Priority will be given to those patients who we know if offered radiotherapy treatment, are going to get cured, those patients who radiotherapy will prolong their survival and other patients who have failed to control the cancer symptoms on all the other forms of treatment,” Dr Orema said. Many more Uganda Patients are coming out from hiding so that their various diseases can be helped out financially by a concerned public. awaiting her blood transfusion procedure at UCI, Mulago. Mercy Nazziwa, a resident of Ntinda suburb in Kampala, is seeking for support of about Shs168m needed for a bone marrow transplant in an Indian hospital as government defends its failure to treat most complicated cases. 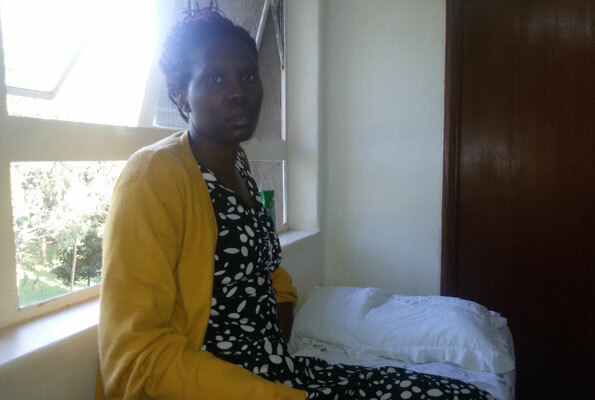 Nazziwa, 36, was diagnosed with aplastic anemia in November last year and she is currently receiving supportive care treatment at the Uganda Cancer Institute located in Mulago. Aplastic anemia is a condition that occurs when the body stops producing enough new blood cells. It leaves patients feeling fatigued and with a high risk of infections due to uncontrollable bleeding. “She currently coughs blood, bleeds from the nose and when she goes into menstruation, her bleeding extends for more than two weeks due to lack of a clotting component in her blood,” said Mr Mukasa. He added that his wife is currently on weekly blood and platelet transfusions in addition to drugs to prevent life threating infections. “I spend about Shs200,000 (£42.00) per week buying the medications required to treat any infections that could be arising, he says, adding that sometimes the cancer institute has a shortage of blood required for transfusion. In a recommendation letter, Dr Henry Ddungu, a consultant hematologist at UCI says Nazziwa needs about $50,000 (Shs168m) to assist her receive a lifesaving bone marrow transplant from India. “A bone marrow transplant is Mercy’s only chance for long term survival. However this procedure is very expensive and is currently not done in Uganda,” Dr Ddungu says, adding that Nazziwa needs assistance to help her raise the money. Dr Ddungu explains that the diseases causes failure of her bone marrow to produce blood cells like red blood cells essential for carrying oxygen to the body and platelets which prevent bleeding and white blood cells which help her immune system to fight infections. Nazziwa’s ordeal comes barely a week after a fundraising seeking to help Carol Atuhirwe, a throat and lung cancer patient, who also needs about Shs270m to undergo surgery in the United States but still has a deficit of about Shs70m. This dilemma is not only for the two patients but for several other patients in Uganda who are in need of support to have treatment in international hospitals. Ms Joy Asasira, a Programme Manager at the Center for health, Human rights and Development (CEHURD) says government has failed to fulfill its obligations of providing quality health care to its citizens. “As a human rights advocate, I think government has an obligation of providing health services and commodities like the cancer machine and it has failed in the that regard,” Ms Asasira said. However, the Health Minister Elioda Tumwesigye defended government saying that it’s not abandoned its people. “We are trying to establish capacity to handle all patients with complicated cases here. We have a plan to build an international specialized hospital and also looking at equipping the Heart and Cancer Institutes to be able to handle these cases,” Dr Tumwesigye said. Currently, Dr Tumwesigye says that in the short-term, the budget for international referrals is underfunded hence not able to cater for every patient. “We have a medical board which accesses the patients for international referrals and there is a case by case consideration,” he says. He notes that the most important thing for government is to build capacity and have all patients handled in Uganda. Mobile Money numbers Nazziwa Mercy 0782960019 and Mukasa Charles 0779391140. Maama womwaana ye Maria Gorrette Nazziwa, abeera Namere, Mpererwe. Akolera Mpererwe Primary School (Church of Uganda School mufumbiro lya baana). He is 52 years old. Unfortunately he has abondoned his child. Muganda wa Gorreta yalina essimu wa myaka 23 era essimu ye eri 0755958436 nga akola nga House Maid okutuusa nga ye Mukyala Gorreta afunyewo sente okufuna essimu eyiye. Omwami omulala ayamba ku maama ono ali mukutegana bwati ye Mr Fred Onen. Essimu ye eyinza okukozesebwa: 0784325229. 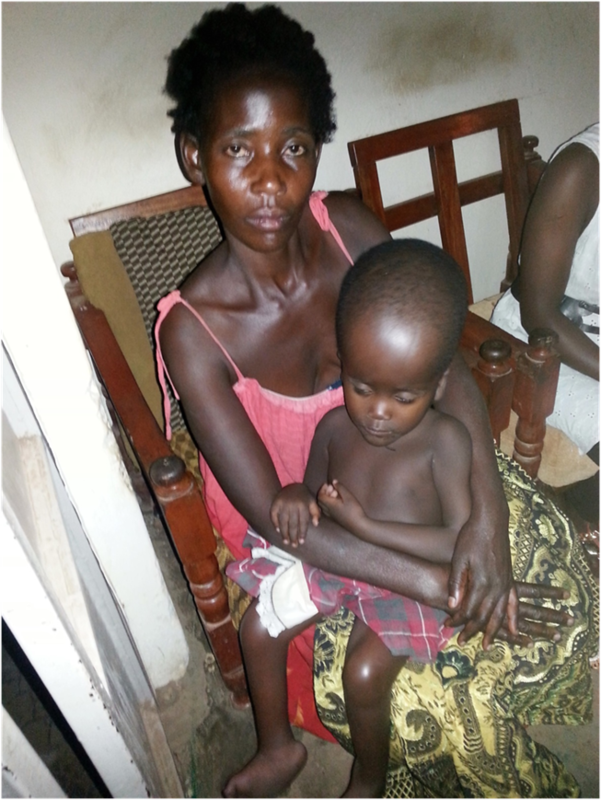 This young mother of 32 years gave birth to her young baby boy at Mulago Hospital in 2012. The baby was born with an abscess behind his back. He was put into intensive care. Surgery was done at six months old to remove the swelling. This surgery excercibated the swelling of the head as can be seen in the photo. His legs are getting deformed and he cannot walk. The specialists could not cope with it all and advised the mother to seek further medical assistance at Katalemwa Chesire Home. M/s Maria Gorette Nazziwa was registered and allocated to one of the hospital branches in the country of Uganda at Mbale. Surgery was done on the swollen and supple head of the child. As the medical reports explain, there was some improvements and the child patient was released from hospital. M/s Gorette is now unable to continue with the treatment of her child. And she has four other children to look after. She has spent over 30,000 of her own money to pay for this whole treatment. She owes the Katalemwa Chesire Home 70,000. Her Husband has refused to assist her in the treatment of her child. L-R: Ms Marianna Garofalui, Unicef’s child protection specialist, Ms Sheeba Afghani, the UN agency head of communications for development and Mr Jaya Murthy, the chief of communication, at a media orientation workshop in Kampala last Friday. Protection: The agency calls on journalists to follow up on acts that violate children rights to ensure perpetrators are prosecuted. United Nations Children’s Fund (Unicef) has appealed to media practitioners to increase space given to highlighting children’s plight to protect their rights. During a media orientation workshop termed “Keeping Ugandan Children Safe” last Friday, the agency said disturbing statistics about children’s rights violation should be tackled. For example, Unicef said in 2013, 78 per cent of children experienced sexual violence in primary schools, of which 67 per cent of perpetrators were male teachers. The statistics also showed worrying figures regarding early marriages among young girls and female genital mutilation (FGM) still raging in some tribes. According to Unicef, 49 per cent of all 20-49 year-old women were married by the age of 18. About 50 per cent still practice FGM among the Sabiny tribe in the eastern region. Mr Jaya Murthy, the Unicef chief communications officer, asked journalists to assist in ensuring that justice prevails in cases where perpetrators are found guilty. “We ask journalists to help and fall up on acts that violate children rights and ensure that perpetrators are brought to book. They should report those parents who negotiate for money whenever their children fall victim,” Mr Murthy said. The ministry of Education technical adviser, Ms Margaret Kasiko, said they have partnered with the Gender ministry to develop a national action plan against violence in schools and communities. “At some point, we have conducted dialogue with both cultural and community leaders since acts like early marriages and female genital mutilation are deep rooted in some cultures,” Ms Kasiko said.